you will arrive at the famous Piazza Republica and its beautiful fountain, this in turn will take you to the grand Via Nazionale, a street packed with shops, restaurants, museums and theatres. We offer many helpful services to assist you during your stay and our courteous multilingual staff are on hand to help you in the best way possible, 24 hours a day. 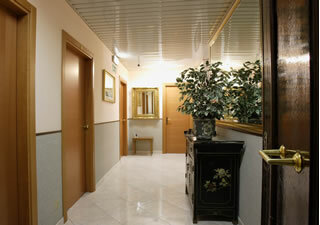 The Hotel Lazzari Rome is a small family run hotel situated in the central area of the Italian capital. This 2 star hotel offers a warm and friendly welcome to its guests and offers a perfectly located base for tourists, pleasure seekers and business travellers alike. Rome’s main railway station (Termini Station) is in the immediate vicinity of the hotel, which makes your arrival from either of Rome’s airports quick and easy as both airports have direct transfers to Termini Station, Ciampino by bus transfer and Fiumicino by train. The Lazzari Hotel is a combination of three separate hotels that are all interlinked. The Castelfidardo and the Andy and Lu hotels all have one common reception area. The Lazzari Hotel offers 14 private guest rooms; single, double and family rooms. All our private guest rooms have en-suite bathroom facilities and the bedrooms themselves are beautifully decorated to give a warm homely atmosphere during your visit. To check availability up to a year in advance click on the Hotel Lazzari Rome Live Booking Service, where you can reserve a room with no deposit and no obligation.